Editor’s Note: This week, Throwback Thursday looks at an album that is the culmination of a lifetime’s work, a lifetime of living and looking at the world, and being given a second chance to do what you love. Sometimes, the universe will throw a person a bone. Sometimes the Gods will smile upon an individual and gave them a second go-around. It doesn’t happen all that often, so when it does, it does a heart good when folks make the most of that second bite at the apple. 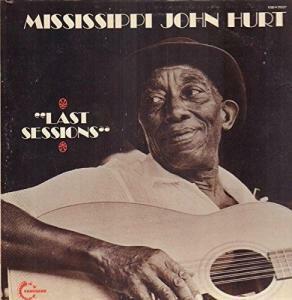 Mississippi John Hurt was born in 1893 (or maybe 1892) in Teoc, Mississippi. At nine years old he began teaching himself guitar, and as time progressed, he would play at parties and local dances and such. Playing and singing was a welcome relief from the demanding work of sharecropping. Hurt made his first recordings with the Okeh Records label in 1928, but alas, these records did not do well commercially. Hurt went back to making his way as a farmer until 1963. Hurt was “rediscovered” by blues devotee and enthusiast Tom Hoskins in 1963, and at his urging Hurt moved to Washington D.C. Hurt would be recorded by the Library of Congress the following year, which in turn, helped further the burgeoning Folk movement and ongoing revival. Hurt’s performance and recording career now took off, seeing him perform on the coffeehouse circuits, and at universities as well. He would also have the good fortune to record albums with Vanguard Records before he died in Grenada, Mississippi in November of 1966. Fans of Hurt, as well as all stripes of blues lovers, can rejoice in the fruits of his Last Sessions on the Vanguard Records label, VSD-79329. Recorded in February and July of 1966, these tracks show Hurt to still be a strong and competent player. Critics have noted his playing here as “complex” and his vocals as still as good as ever. Hurt is supported on a couple of tracks by Patrick Sky on second guitar. Other than that, it is all Hurt’s vocals and his mesmerizing playing. As we sit and listen to this journey through some of his finest work, we can not help but marvel at the simplicity, beauty, and freshness of this music. What’s not to love as we listen to Bukka White’s “Poor Boy, Long Ways From Home,” or his own “Let the Mermaids Flirt with Me”? Before we know it, we are tapping our fingers and our feet too! The music here is extraordinarily simple and pleasant, and these 17 performances lift a spirit up. Surely there will be some who say that this is not Hurt’s best work, and while that’s a discussion for another day, it is a certainty that this album will put a smile on your heart.